I have so much respect for this woman’s profound talent and her artistic perspective. As someone who has to create stuff, I find something inspirational in most of her interviews. If you’re not an opera fan, try out “Forever,” her first album of Broadway and film standards. It’s been in heavy rotation on my phone for the past year and a half. All across this great nation of ours, men and women return to their homes after a long day at work only to discover that a sniper or somesuch has barricaded themselves behind the front door. Oh, wait, no: it’s just yet another day’s worth of deliveries. It’s just part of the ongoing aftermath of Black Friday online shopping. So far this week I myself have had to climb over little forts made out of DVDs, hard drives, books, and an HDTV. Fortunately, this particular annoyance will soon be but a distant memory. First, because with the economy the way it is (current status: “Americathon,” with a 70% chance of widely-scattered “Road Warrior” by Q2 2009) the day of buying things is pretty much over. Except for more ammo, maybe. You can’t have the neighbors coming over and expecting a handout when they smell the Soy Sauce Packet And Used Paper Towel Roll Casserole you’ve got cooking. Secondly, because now even digital downloads have become part of the overall Black Friday cultural mass-suicide. 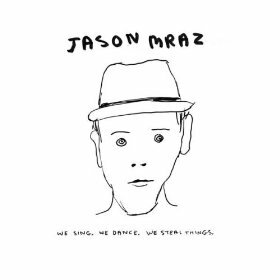 I came to own Jason Mraz’ “We Sing, We Dance, We Steal Things” when Amazon selected it as one of 50 MP3 albums discounted to five bucks for the holidays. I liked the album art enough to click the link and sample the tracks. Then I shrugged and patted myself on the back for being the sort of financial heavy-hitter that could recklessly throw away $5 on a flutter. No, I’d never heard of the dude before. And this triggered my usual hesitation. If I were a more evolved lifeform, I could enjoy a song sight-unseen on its own merits, and not worry that later on, I’d learn that this “edgy, agile practictioner of the ‘New Masters’ movement” as I’d described him on Twitter is actually a character in a Disney channel show. But good, good: he’s the real deal. So what I said there stands. Oh, wait…I did make up the “New Masters” movement thing. Doesn’t matter. Mraz writes highly melodic pieces that exhibit a lot of care. I don’t think there’s anything accidental about how this music is composed and performed. Though the singing reminds me of a young Stevie Wonder in places, and a slide guitar wanders freely in and out just like in a good George Harrison tune, Mraz seems to be doing his own thing. And the man knows how to write a pretty song, free of treacle and schmaltz. “A Beautiful Mess” comes around on Shuffle Play and your endocrine system obligingly dumps a few micograms of Contentment Juice into your pleasure centers. At the end, you tap the “Prev Track” button, shut out all distractions, and enjoy a rerun. Hey, cool, it turns out that Amazon’s “$5 Album” deal is still on. This link goes to the track but o’course you can click around and get the whole thing if you’re so inclined. Oh, and apparently it’s on the iTunes Store as well. 128K bitrate, DRM, etc. Look, I’m not saying that there’s anything wrong with this organization. But their refusal to give me referral kickbacks that I can apply toward the purchase of camera lenses and other knicknacks…that’s kind of suspicious, wouldn’t you agree? Hmm?